Beautiful, spacious CORNER LOT home located in the FRIENDLY neighborhood of Ayersworth Glen! This home features 4 bedrooms, 2 full bathrooms, and a 2 car garage. View gorgeous sunsets right from the dining room. 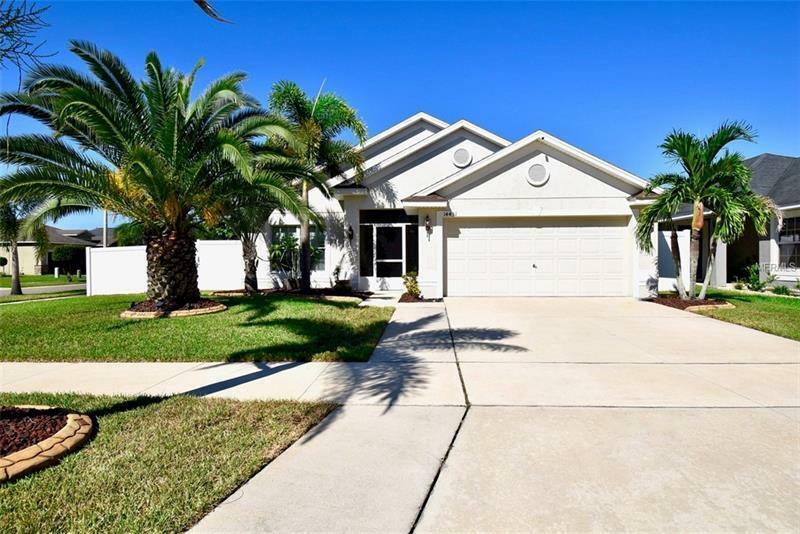 Bright, open floor plan with a screened-in lanai/entry way and a large fenced backyard with a private side entrance through a double gate. Perfect place to park your boat, out of sight! BRAND NEW TRAVERTINE TILES throughout the entire home. 8 security cameras give you 360 degree view around the home, straight to your phone. One of the four bedrooms is located at front of the home with pocket doors, can be used as office/den/playroom. Never buy avocados again, large avocado tree on the lot! Beautiful palm trees complement the front, back and side landscape. GREAT LOCATION, conveniently located off Hwy 301 with quick access to I-75. Low CDD/HOA. AWESOME home at an AFFORDABLE PRICE!